Unmarried certificate format is very simple. Unmarried certificate in Pakistan can be on stamp paper. In this Pakistani unmarried certificate your close relative state that he or she know you personally and undertakes that you are unmarried and is not engaged with someone. This single certificate in Pakistan can also be attested from notary public and from ministry of foreign affairs. If both the parties are abroad and one of the parties is a Pakistani national then instead of getting married abroad they can also avail the services of online marriage in Pakistan. Nazia Law Associates can provide you the services of single status certificate from Pakistan and at the same time Advocate Nazia can get you the services of online marriage in Pakistan. The reason of getting the Pakistani single certificate attested is confirm its authenticity. 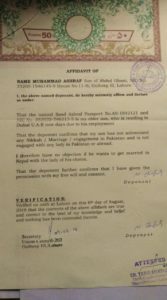 This single status certificate in Pakistan is attested from union council of the area where such person resides for the reason that the nikahnama is normally registered in the area of such person where he resides. This Unmarried certificate from Pakistan is attested from notary public because every Pakistani document which is to be used abroad requires attestation from notary public. This single certificate is attested from ministry of foreign affairs because it’s the ministry which will tell the other country that this document is valid. All these steps for the bachelor’s certificate in Pakistan needs to be followed step by step. In the first position a stamp paper will be issued on the CNIC of any of your relative. Then it will be drafted by a professional lawyer. In the next step it will be signed by the person who is giving this affidavit. Later on it will be attested by the relevant union council, notary public and ministry of foreign affairs. If you can do it yourself then its fine otherwise better to hire a professional lawyer for this work. Nazia Law Associates is a professional law form in family cases and can easily drive you from the process of this single status certificate in Pakistan. Please contact Advocate Nazia who will help you in getting this unmarried certificate in Pakistan within no time.